I love licorice and I also love liquorice liqueurs. One of my favorites is Sambuca, an aromatic liqueur made with anise, star anise, liquorice and elderflowers. When you order Sambuca in Italy it will often come served with coffee beans floating in it. Either seven, representing the Seven hills of Rome, or three, for health, happiness and prosperity or just one coffee bean which is called Sambuca con la mosca or Sambuca with the fly. It's fun and I love Sambuca with coffee but I had a better idea, one that involved a fun way to play a trick on my friends. Making an olive out of marzipan and serving it in a clear cocktail that looked like a gin martini sounded like a good prank to play. I'd made a marzipan flavored martini before with vanilla vodka and amaretto but it was really sweet and my tastes have changed considerably since then. When I switched to the coffee vodka with Sambuca and bitters I ended up with a much better cocktail. 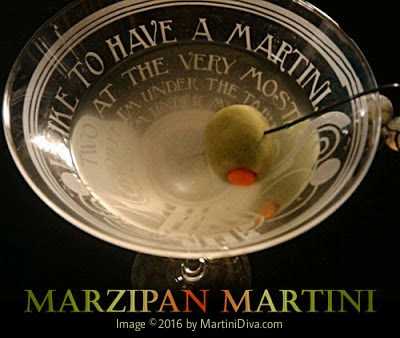 What was kinda cool too is that the food color in my marzipan olive slowly made the drink look like a dirty martini so anyone arriving late could still be deceived. You'll notice I specify in the recipe to chill the vodka and the Sambuca as well as the glass. This is so your cocktail will be cold. If you mix Sambuca with ice or water it will most likely louche (turn milky), which would keep the cocktail from being clear and ruin the deception. If you're not trying to play a trick on somebody, feel free to shake the cocktail with ice. When your glass is well chilled, pour in the chilled coffee or espresso vodka, the chilled Sambuca and stir gently. Tap on the chocolate bitters, garnish and serve. Prepare your glaze ahead of time by bringing the water and corn syrup to a boil and mixing until the sugar dissolves. Once dissolved set aside to cool. Place your almond paste in a bowl. and add the corn syrup. Knead in the corn syrup. Slowly add your food colorings a little at a time until you get the desired color for each section of dough. Separate the dough into as many sections you need for the colors you want to work with. Slowly add your food colorings a little at a time until you get the desire color. Brush on a coating of glaze and set on waxed paper to dry. Store finished candies in airtight containers. You can pre-color your marzipan or you can work with uncolored and paint or airbrush on food coloring. In this case I pre-mixed the colors I wanted for each sculpture. P.S. 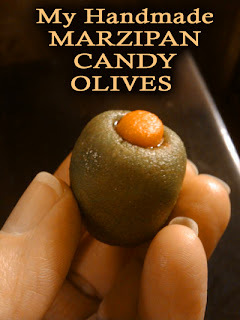 How adorable is my little Marzipan Candy Olive? ?